The Dwight Harrigan ExxonMobil Bayou Boardwalk offers a winding trip across an authentic southern bayou allowing guests a close-up view of fish, turtles, waterfowl and other wildlife as well as the natural vegetation needed to support this ecosystem. Interpretive panels along the boardwalk give visitors additional information about the ecology, history, animals and plants of the Fowl River watershed. The bayou offers a startling contrast to the orderliness of the Gardens. 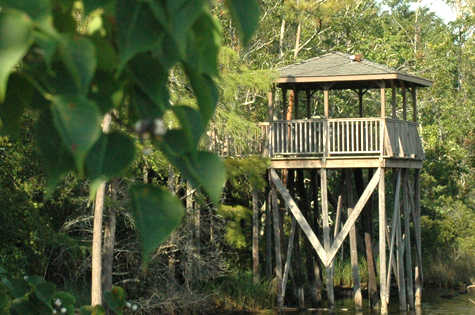 Guests may also overlook the view of the bayou from the Bayou Observatory.